The growth rate of avocado’s popularity has been mindblowing. We can’t get enough of it and we’ve seen so many ways we’re enjoying it. We’re happy to introduce you to yet another way to add this delicious and healthy fruit (yes it is a fruit) to your meals. Say hello to Kumana Avocado Sauce, a range of fresh and vibrant avocado sauces that are amazing on just about anything you love eating. These delicious sauces are crafted from veggies and fruits such as avocados, fresh onions, bell peppers, cilantro, garlic and just a splash of white vinegar. 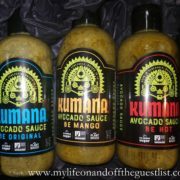 Kumana Avocado Sauce adds a punch of flavor to anything you put it on. 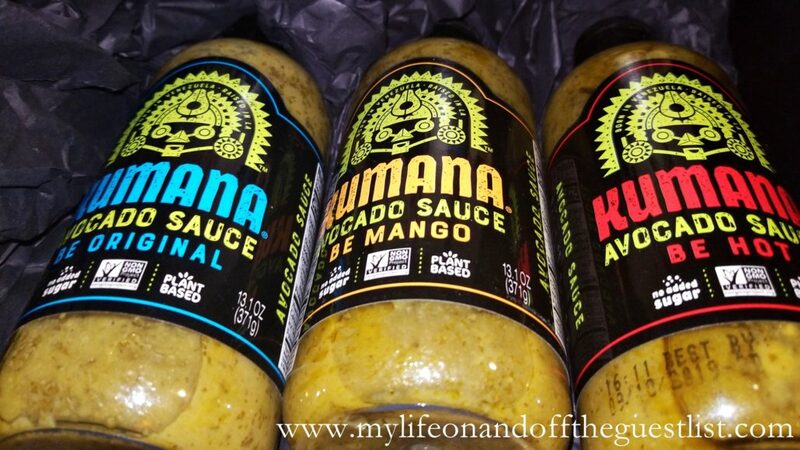 Be Original: The truest recipe to the Venezuelan avocado sauce that inspired the Kumana line. Be Mango: Blended with mango puree which adds a hint of sweetness, much like mango salsa. Be Hot: Takes a splash of mango and finishes it off with just the right amount of habanero heat. All three avocado sauces are plant-based, gluten-free, non-GMO verified, has no added sugars, and is the first shelf-stable avocado sauce. Since our love of avocado begun in our childhood, we couldn’t wait to try these sauces. 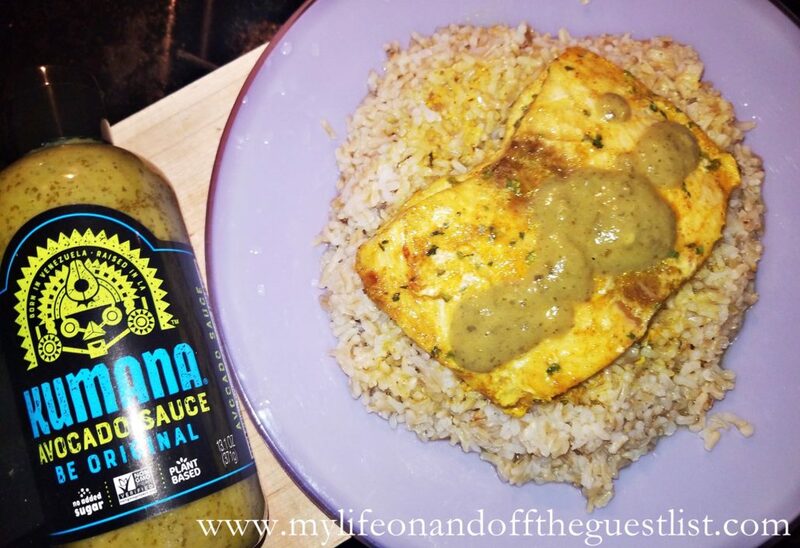 We cooked a wonderful piece of Mahi-Mahi over brown rice and topped it off with the Be Original Avocado Sauce. The Be Original gave our fish dish a wonderful, slight kick and enhanced the freshness. Next, we tried it with a bit of the Be Sweet and loved the combination of the fruity sweetness of the mango with the savory fish. This was actually our favorite flavor combination. Last but not least, was the Be Hot Avocado Sauce, and although it was really enjoyable, we felt the flavor intensity overpowered our Mahi-Mahi. We think the Be Hot would work amazingly with a more flavorful fish. Next, we did try the Be Hot with chicken the next week with absolutely fantastic results. Whether it’s fried or baked chicken, you’ll love the flavor. 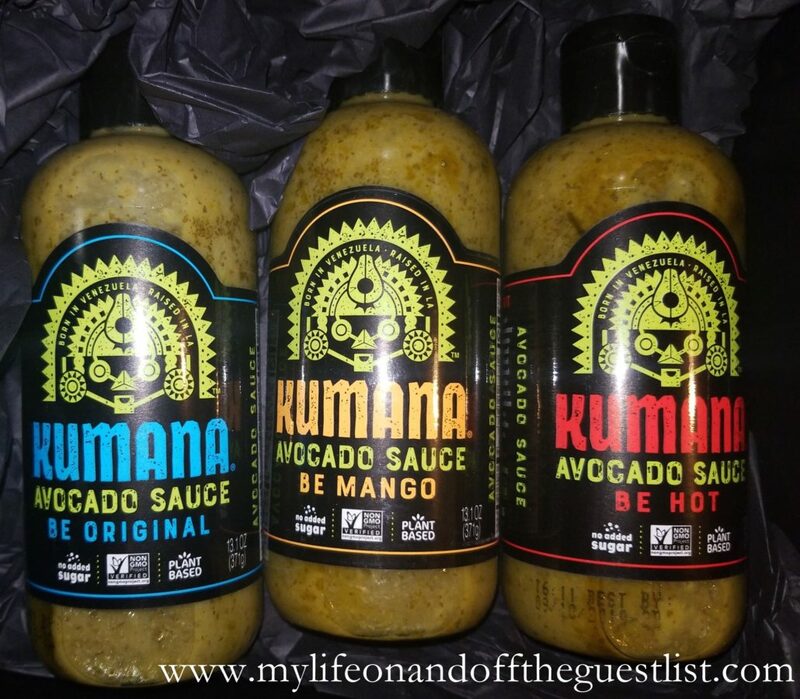 Kumana Avocado Sauce is a great addition to your pantry. Whether you’re a meat eater, vegan, or on a keto diet, this will wow your taste buds. Get all three flavors the Safeway, Acme Supermarkets, Albertsons, and United Supermarkets. You may have noticed there’s a big resurgence of adding more raw foods to one’s diet. More and more people have been enjoying foods that are mostly or entirely uncooked, and unprocessed. It’s all about attempting to eat clean and healthier. Whether it’s eating more raw vegetables, fruits, vegetables, nuts, seeds, eggs, fish, meat, or dairy products. This is a practice that has prehistoric origins with a modern initial introduction in the 1930s and is experiencing a resurgence now. Let’s face it, food is better for you without all the artificial and processed junk. Launching just in time for Heart Health Month, The Wonderful Company welcomes its Natural Raw Wonderful Pistachios, joining their already successful Natural Raw Wonderful Almonds, originally launched in 2012. 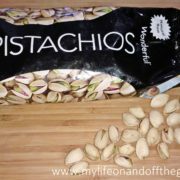 A perfect way to add more plant protein to your daily diet, the Natural Raw Wonderful Pistachios have a rich, crunchy, nutty flavor, in their natural state. Pistachios are one of the lowest-calorie, lowest-fat nuts around. There is no roasting or salting done to them at all, and they are a delicious way to enjoy the raw food diet. One handful of Natural Raw Wonderful Pistachios (about 30) is a sensible, delicious snack with only 100 calories, with lots of protein and fiber. Naturally cholesterol-free, low in saturated fat, and full of nutrition, Natural Raw Wonderful Almonds might be the perfect healthy snack for everyone. They are vegetarian, vegan, gluten-free, Certified Non-GMO, dairy and soy free, Kosher (certified by the Orthodox Union) and Halal (certified by the Islamic Food Nutrition Council of America). Almonds are among tree nuts that are the highest in protein, calcium, fiber and the antioxidant vitamin E. Plus they are a great tasting, convenient, and heart-healthy everyday snack. Natural Raw Wonderful Almonds are available now in 1.5oz. bags ($0.99), 6.3oz. bags ($3.99), and 7oz. (4.49). Natural Raw Wonderful Pistachios officially launches this February and will be available in 16oz. bags for $9.99. Both can be found at leading grocery retailers nationwide. 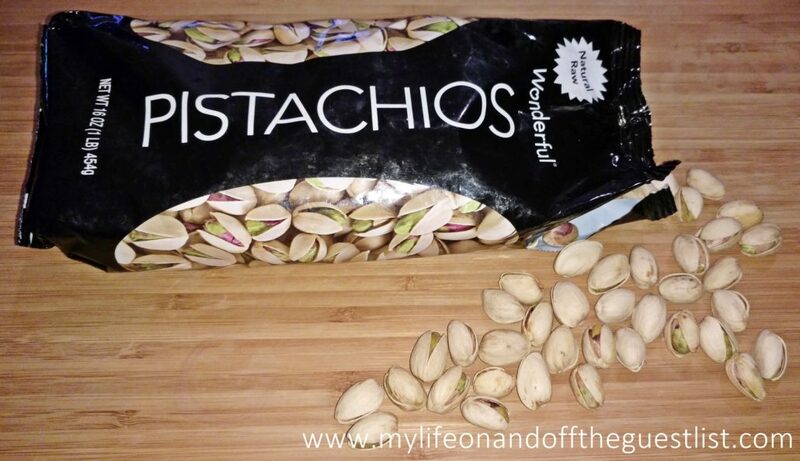 Could Wonderful Pistachios and Almonds help you add more plant protein to your daily diet? We’d love to say we prepare lovely meals and meal prep for the week but there is not nearly enough time in the day. Instead, we satisfy our foodie appetites with dinner out with friends when our budget allows, and savory, ready-to-eat quick meals like the Cucina and Amore Quinoa Meals. They are perfect for those of us who have no time to cook, or are just looking for a quick, healthy meal or snack. These gluten-free, preservative free, and non-GMO meals are not only jam packed with nutrients, they are conveniently packaged for on-the-go ease. 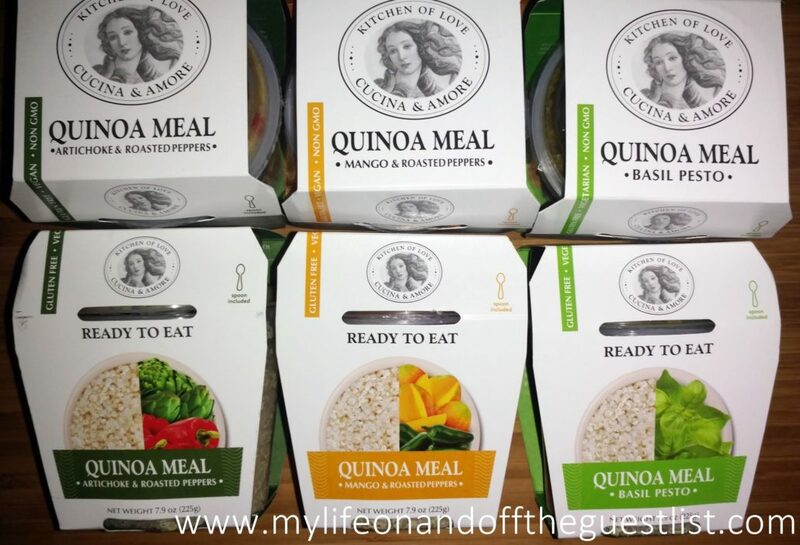 The Cucina and Amore Quinoa Meals are available in four delicious flavors, Artichoke & Roasted Piquillo Peppers, Mango & Jalapeno Peppers, Basil Pesto, and Spicy Jalapeno and Roasted Peppers, that are vegan (the Basil Pesto is vegetarian). The Basil Pesto Quinoa Meal will wake up your taste buds with a delicious blend of basil and pine nuts; the Mango & Jalapeno Quinoa Meal is the perfect balance of sweetness and hint of fire; and if you really love spicy food, the Spicy Jalapeno, and Roasted Peppers Quinoa Meal will blow your taste buds away. Whether you’re vegan (vegetarian) or a carnivore, you’ll love these prepackaged quinoa meals (they make great side dishes by the way). And if you are vegan, the Cucina and Amore Quinoa Meals are excellent sources of amino acids, various B vitamins, and protein. 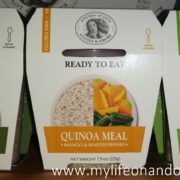 The ready-to-eat quinoa meals come in microwavable BPA-free containers, need no refrigeration, can be enjoyed hot or cold and comes with a mini spoon. The next ancient grain to get excited for is Farro, an excellent source of vegan protein, fiber, antioxidants, and nutrients like magnesium and iron. 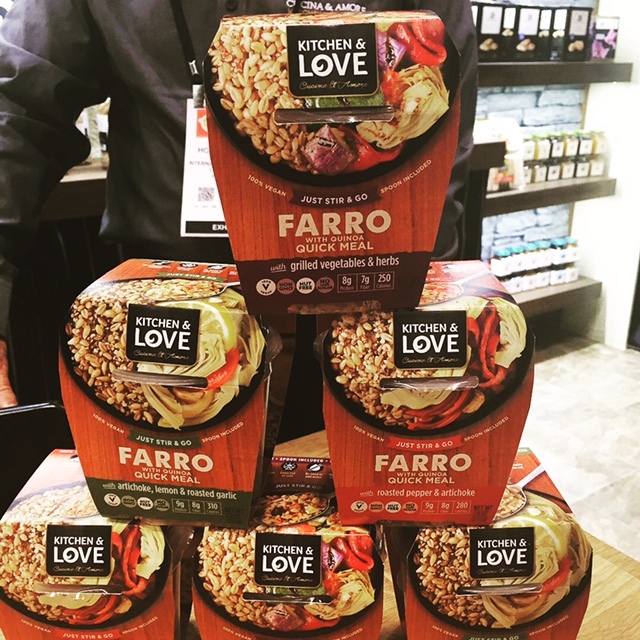 Launching this fall from Cucina & Amore is their range of Farro with Quinoa Quick Meals in three mouth-watering flavors, Grilled Vegetables & Herbs, Roasted Pepper & artichoke, and Artichoke, Lemon & Roasted Garlic. These healthy, innovative products will help keep you feeling fuller longer, making it easier to manage your weight, as well as help to improve protection against diseases. What are your thoughts on these healthy Italian dishes? Will you be trying these Cucina and Amore Quinoa Meals? The most important meal of the day doesn’t have to be a quick bite on the go. It can be a delicious and hearty breakfast featuring the best ingredients like free-range, non-GMO eggs and artisan meats. When it comes to these simple and healthy ingredients, look no further than NestFresh Eggs and Godshall’s Quality Meats. We had the pleasure of being introduced to these wonderful and hearty products a few weeks ago. 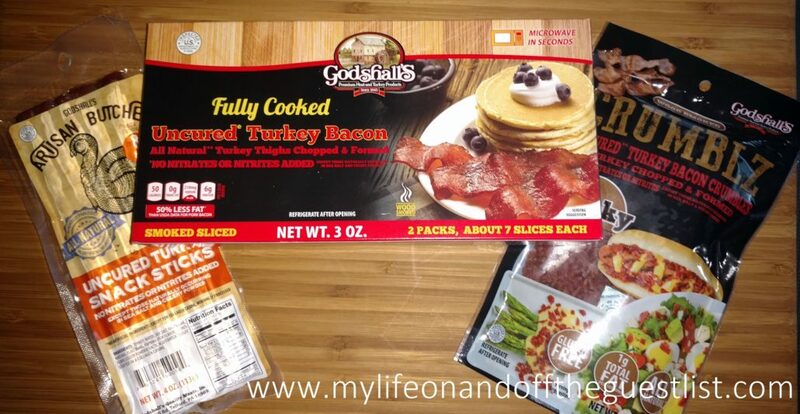 Using these great NestFresh Eggs and Godshall’s Quality Meats, we’ve satisfied both our healthy meal guidelines and our almost insatiable foodie appetites. NestFresh believes in the humane treatment of egg laying hens, which is why they only offer cage free eggs, organic eggs and pasture raised eggs. 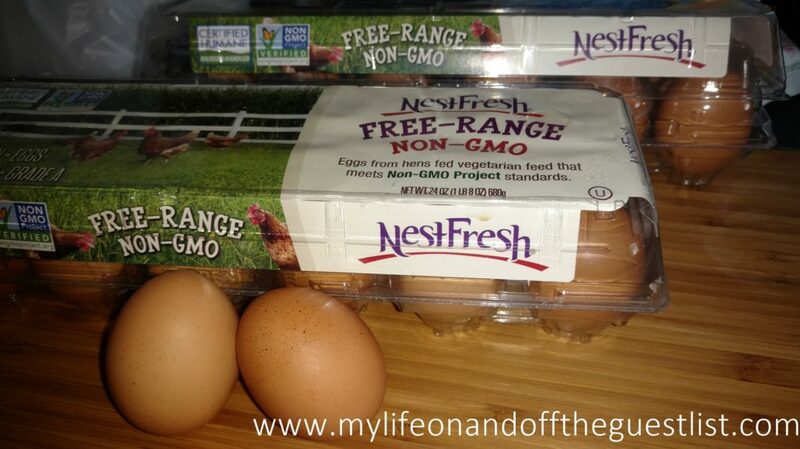 The NestFresh hen is 100% cage free and enjoys a more natural way of life. Trust us when we say, the treatment of NestFresh hen is reflected in the absolutely delicious taste of these eggs. Not only did they have a richer flavor, they just tasted fresher too. We found our NestFresh Eggs at the Fairway Market on 26th Street in NYC, but you can also find them at Whole Foods, ShopRite, Kings, etc. 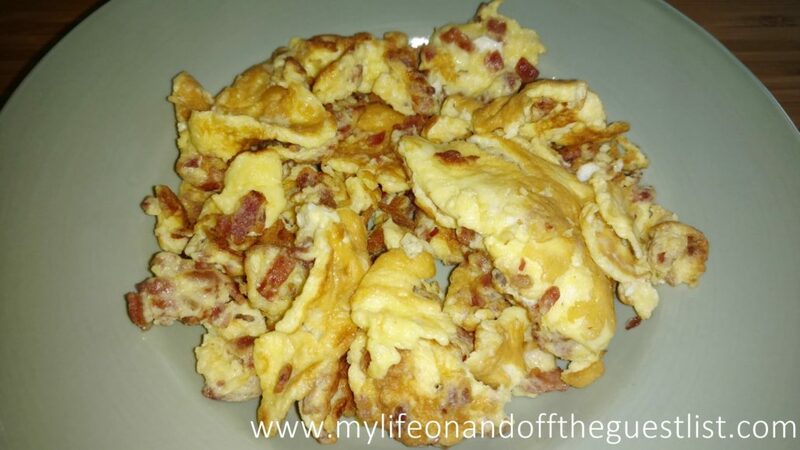 What goes better with eggs than bacon, and Godshall’s Quality Meats is just what you need. Known for their premium, real wood smoked meat specialties, like their Turkey, Chicken and Beef Bacon, Godshall’s has been satisfying households since 1945. To keep up with our healthier routine, indulged in Godshall’s Quality Meats’ newly launched products: Artisan Butcher Turkey Breast, Uncured Turkey Bacon Crumblz, and Fully Cooked Uncured Turkey Bacon. All Godshall’s products were all natural and flavorful. The Fully Cooked Uncured Turkey Bacon boasts the same real meat, real wood Smoked Turkey Bacon taste, with No Nitrates or Nitrites! The Uncured Turkey Bacon Crumblz was a revelation on salads, pizzas, in our soups, and of course, it was perfect with the NestFresh Eggs. Talk about flavorful! 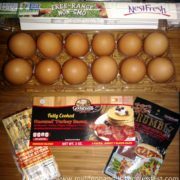 The combination of NestFresh Eggs and Godshall’s Quality Meats blew our taste buds away. Although the above was a simple dish, every bite was a delight and met all our expectations of a healthy, hearty meal. We highly recommend you give these two brands a try and make sure they gain a spotlight during your breakfast. Godshall’s Quality Meats are available at Sam’s Club and Acme Supermarket. The spring season is finally upon us, even though Mother Nature gifted us with snow and low temperatures on the first day of Spring. 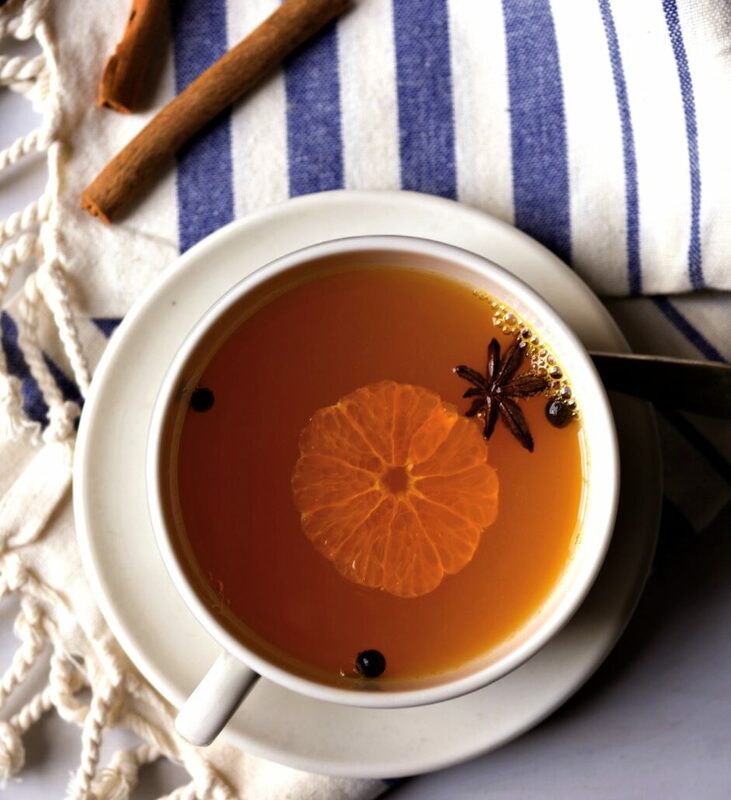 Thankfully the temperatures will rise again because we are so very ready for the season of warmer days, blossoming flowers, and delicious citrus flavors…especially the citrus flavors. Over the past few weeks, we’ve found ourselves becoming addicted to the sweet, seedless, and super easy to peel Wonderful Halos Mandarins. These all natural, non-GMO, California mandarins are not only the perfect snack, they’re wonderfully delicious in recipes. Of course, just because they are the right size for kids’ hands doesn’t mean we adults can’t enjoy them (like we’ve been doing). The Wonderful Halos mandarins come in two varieties: Clementines, which are available from November to January, and W. Murcott Afourers which are available from February to April, allowing you to enjoy this sweet and healthy alternative to fatty foods fruit, six months out of the year. In celebration of spring, we’re sharing some delicious recipes featuring these sweet little balls of sunshine. Of course you can also enjoy them on their own, especially as they’re only 50 calories and provide 45% of the recommended daily dose of vitamin C.
For each flavor, combine all ingredients in the pitcher of a blender. Cover and blend on high speed until very smooth, about 2 minutes. 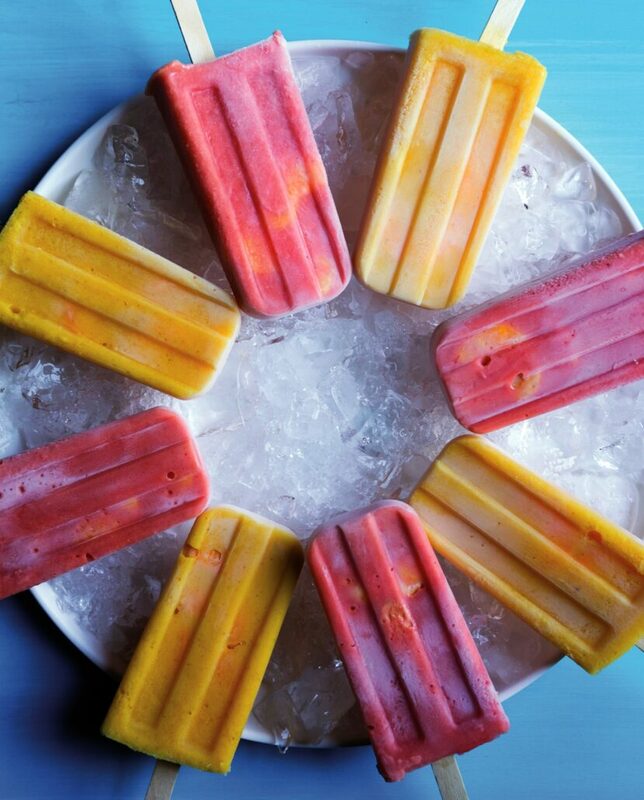 Pour into ice pop molds and add extra Wonderful Halos mandarin segments to each pop; insert sticks. Freeze until solid, remove from molds and serve immediately or store in a zip lock bag in the freezer. Heat oven to 375ºF. Slice baguette thinly, brush with olive oil and bake until just toasted. Let cool. Make Wonderful Halos mandarin chutney: In a skillet over medium heat, sauté the shallot and salt in 1 tablespoon olive oil until soft and translucent, about 20 minutes. Add the vinegar, brown sugar, bay leaf and coriander seeds and let simmer until vinegar is reduced and almost gone. Add the Wonderful Halos mandarin segments and stir; remove from heat. 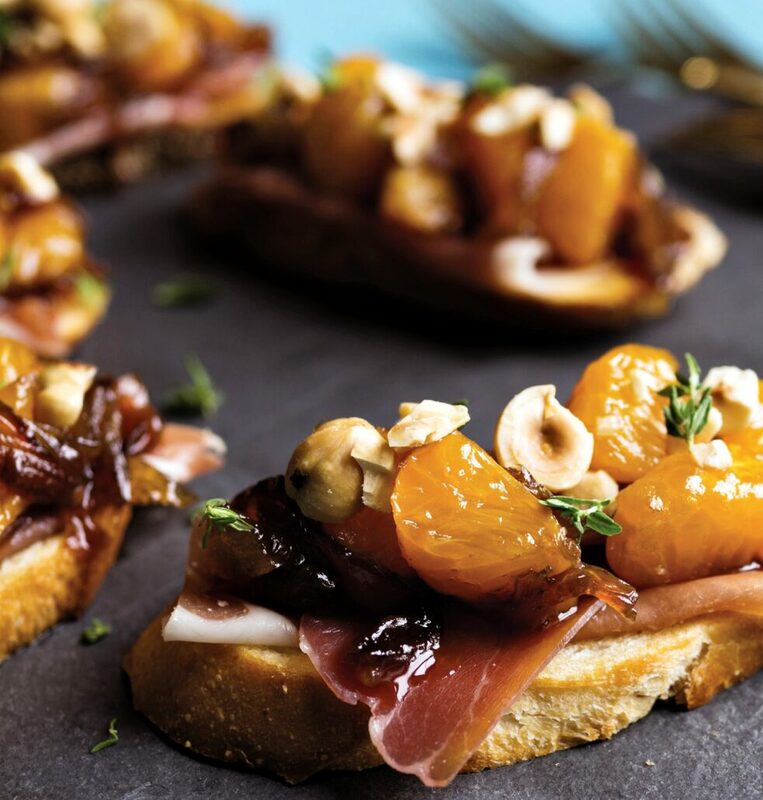 Top toasted baguette slices with a ½ slice of prosciutto, a spoonful of the Wonderful Halos mandarin chutney and sprinkle with hazelnuts and thyme. Juice Wonderful Halos mandarins and lemons. Strain out pulp and set aside. Combine all ingredients in a medium saucepan. Heat over medium-low heat until sugar has dissolved and juices are hot. 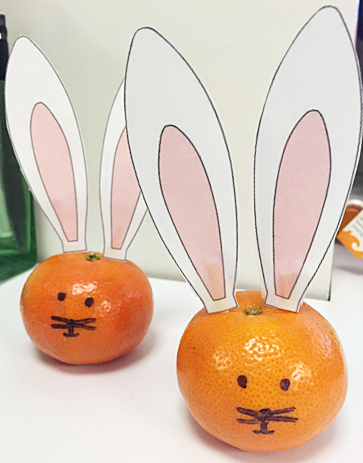 Serve garnished with a thinly sliced Wonderful Halos mandarin. Cook quinoa according to package directions and set aside to cool. Heat a grill or grill pan over medium-high heat. Mix together the salt, chili powder, and cumin and rub on chicken. Grill chicken on both sides until cooked through; set aside to cool, then slice. To make the chipotle lime vinaigrette: Whisk together the lime juice, garlic, honey, adobo sauce, salt and olive oil. Then discard halved garlic cloves. 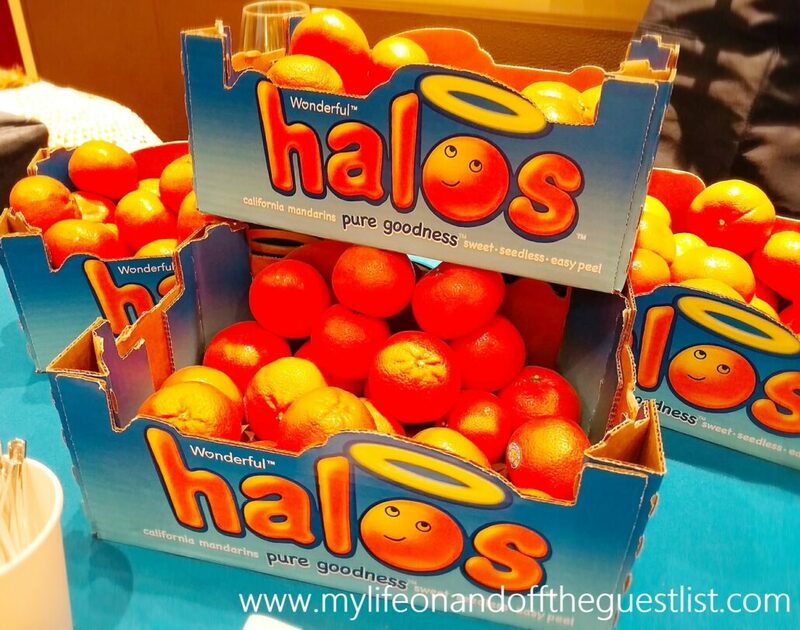 Peel Wonderful Halos mandarins and separate segments. Spoon quinoa into 4 bowls. 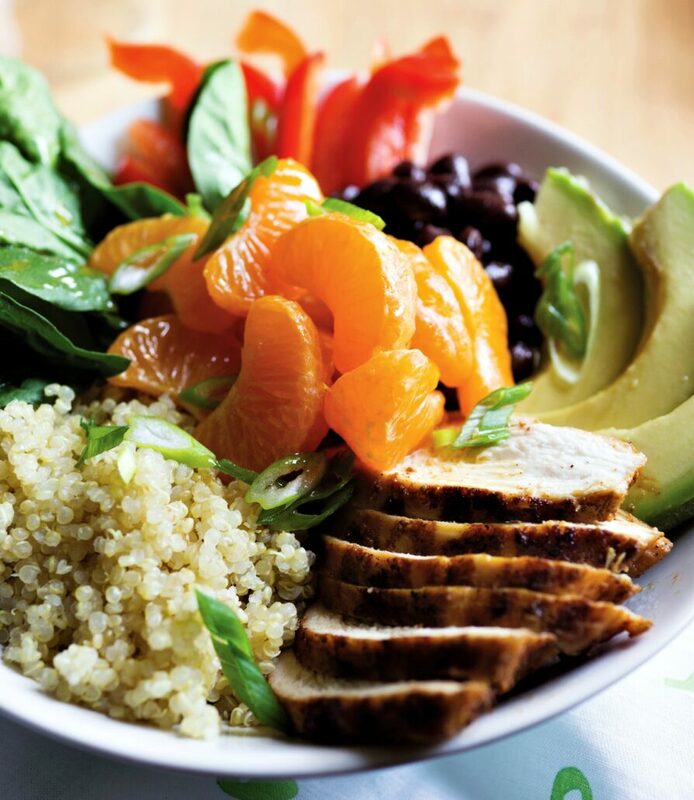 Top each bowl with some spinach, black beans, bell pepper, avocado, Wonderful Halos mandarin segments and sliced chicken. Drizzle each with vinaigrette and sprinkle with scallions to serve. 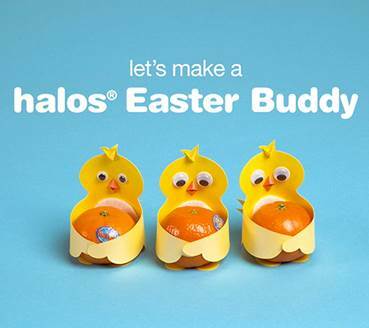 Now that we’ve gotten a variety of family-friendly recipes to enjoy Wonderful Halos, here’s a fun way you and your children can enjoy this kid-friendly fruit this Easter. 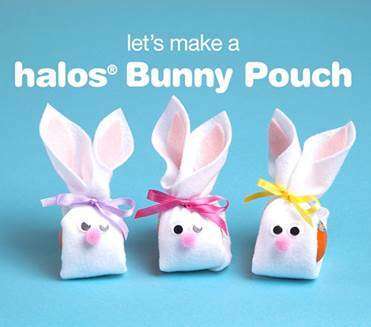 For some fun Easter crafting, paint your Halos just like you would paint your Easter eggs, or stick bunny ears on your Halos for an easy, cute, and healthy decoration that will vitalize your easter basket. 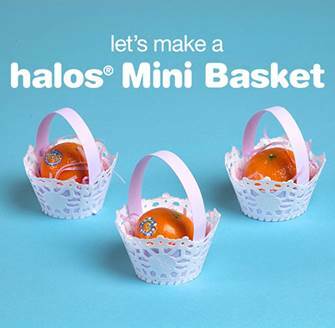 Wonderful Halos are available in 2-count, 3lb, and 5lb bags, as well as a 5lb box, at the following stores: Shoprite, Aldi’s, Whole Foods, Target, Costco, Food Lion, etc. Today we honor one of, if not, THE best tasting snack of all time, potato chips. Yes, ladies and gentlemen, today is National Potato Chip Day and we’re celebrating by highlighting (and devouring) our favorite potato chips, Boulder Canyon Potato Chips. 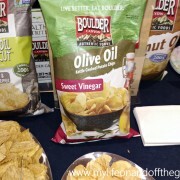 If you’re not familiar with the brand, they make the best tasting, all natural, gluten-free potato chips (and most recently popcorn), using real food ingredients, and cooking them in small batches using only premium oils such as sunflower, safflower, avocado, coconut, and olive oils. 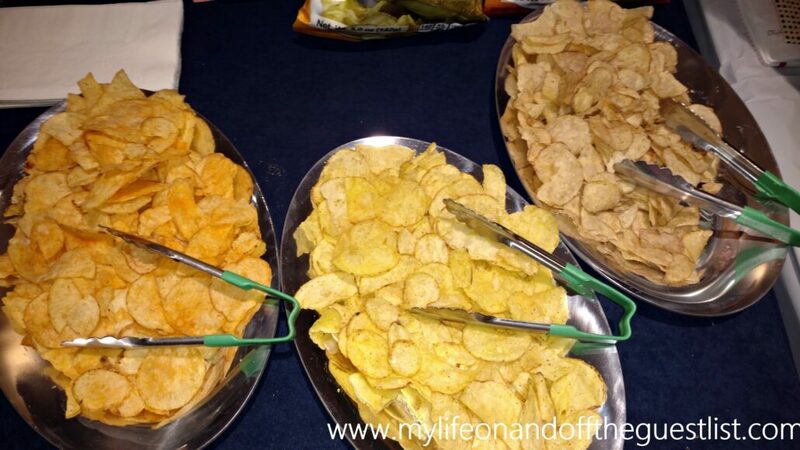 Are you ready to celebrate National Potato Chip Day with Boulder Canyon? We were recently introduced to Boulder Canyon’s latest flavors, and trust us when we tell you, you won’t stop eating them. First up the Sweet Vinegar Olive Oil and Red Chili Olive Oil kettle cooked chips, which combine the bold rich flavor of olive oil with a splash of sweet vinegar for a tangy tasting chip, and the savory zing of red chili for an intense taste. Both flavors are higher in beneficial monounsaturated fats than traditional potato chips. Next up is the Avocado Oil Sea Salt & Cracked Pepper, which features avocado oil, potatoes, a zesty pinch of salt combined with a kick of pepper for a perfect snack. You still enjoy the rich buttery taste of the avocado with a peppery kick. These canyon-cut potato chips are the ultimate potato chips for those who love a purist approach to snacking, and they’re also perfectly made for dips. Another flavor we’re loving is the Coconut Oil Kettle Chips, which combines pure coconut oil and sea salt to the original kettle chip bringing it to another level of delicious snacking. And there’s more deliciousness to come. 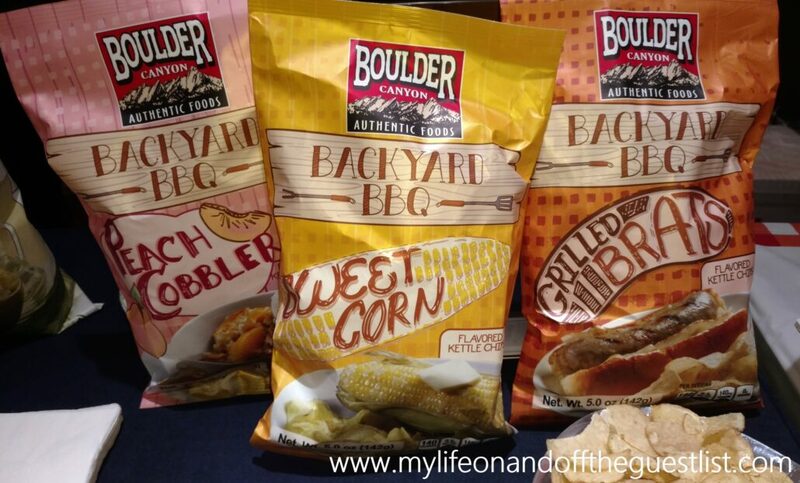 Take a look below at some of the upcoming new potato chip seasonal flavors from Boulder Canyon, including Backyard BBQ Peach Cobbler, Backyard BBQ sweet Corn, and Backyard BBQ Grilled Brats, we can’t wait for BBQ season! Are you salivating? We sure were, and because these are Boulder Canyon potato chips, they’re all made from the best quality, non-GMO ingredients. 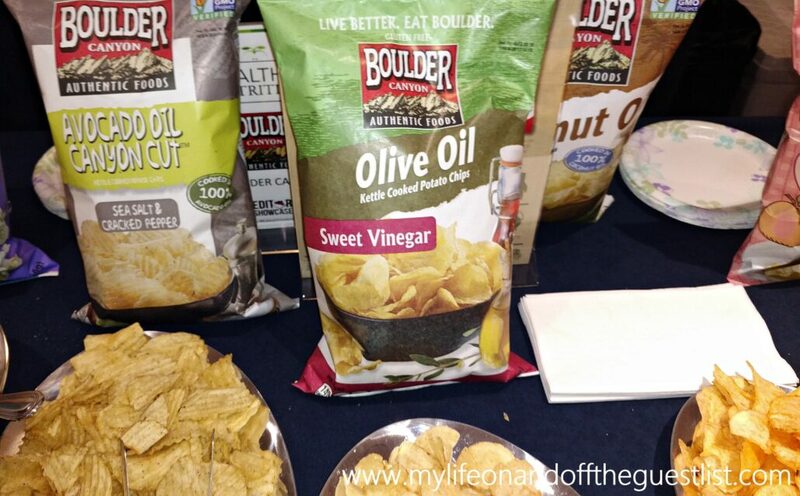 Most (if not all) of Boulder Canyon’s over 30 available better-for-you snacks are certified gluten-free, have no MSG, no trans fat, no cholesterol, is low in sodium, is kosher, and vegan. No matter how hard you try, trying to eat healthy, or even just eating period is next to impossible during fashion week. We’re always running from show to show or from presentation to lounge events, to complete insanity while barely gulping on some random bit of sustenance, usually coffee or tea, when times like these call for something healthier, more fulfilling and delicious. Nothing awakens your hunger pangs than burning lots of energy like trying to complete the obstacle course that is attending NYFW, in heels no less. 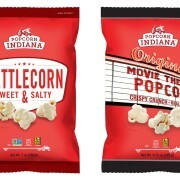 By day 2 or 3, you’re ready for portable snacks like Popcorn, Indiana‘s range of delicious popcorn, to keep you going. Popcorn, Indiana has what any on-the-go fashionista needs to keep up with a hectic NYFW schedule. The wide range of products are non-GMO, made with whole grains, vegan and gluten-free, and come in a variety of wonderful flavor options and since healthy snacking is always in style, their pure, delicious, guilt-free popcorn allows you to snack heartily without feeling bad about overindulging or leave you still feeling hungry, as you sprint from show to show. Popcorn, Indiana has something for all and every kind of popcorn lover from Kettlecorn purists to Cheddar-loving enthusiasts. With the company’s adherence to non-GMO corn, you can rest assured that all the components of each flavor, from Movie Theater Flavor to Sea Salt, will uphold a natural and pure standard. Popcorn, Indiana’s commitment ensures a fresh and natural taste, which allows you to really enjoy and stay secured in the essence of pure deliciously popped corn and quality ingredients, even when you have to down it on the fly. Pop a bag in your bag, or bags, and stay nourished in between discovering new hemlines and silhouettes. Popcorn, Indiana is guiltless eating that really gives sustenance for your on-the-go fashion schedule. 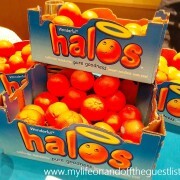 These delicious snacks certainly kept us going during this season of NYFW, imagine what it can do for your hectic life. Are you as much of a fan of these wonderful popped treats as we are? Share your thoughts in the comments. You know a fruit spread is amazing when you pass on all breads, crackers, etc and dive right in to the jar with a spoon. That was our immediate reaction the first time we tried the delicious Crofter’s Organic fruit Spreads. 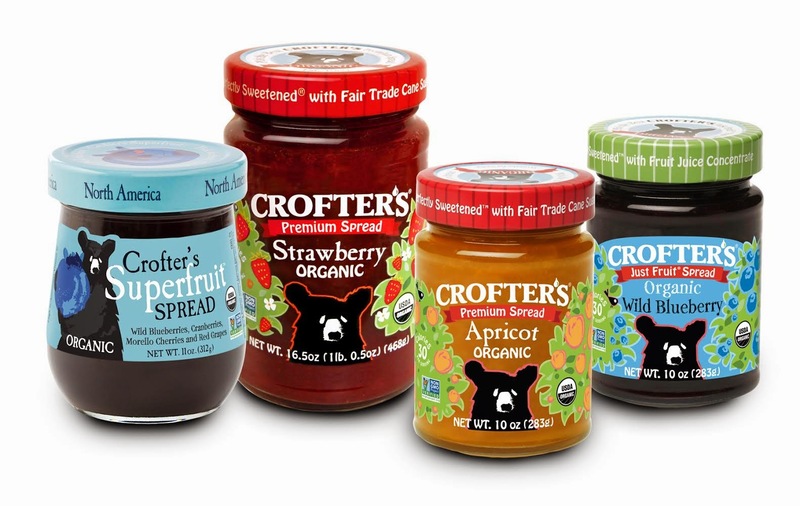 Crofter’s Organic boasts more than 20 certified organic, Non-GMO Project verified spreads, fair trade cane sugar sweetened Premium Spreads, high antioxidant Superfruit spreads, and Just Fruit Spreads, with no added cane sugar made from high-quality ingredients from the best sources on earth. The Ontario-based, family-owned manufacturer, he largest organic jam manufacturer in North America, has been gifting the public with premium fruit spreads for the past 25 years. We had the pleasure of sampling a few of their organic fruit spreads, which we can tell you, didn’t last long in our refrigerator. Crofter’s Organic offers nutritious spreads that features 1/3 less sugar than traditional preserves, and are free of preservatives. The Premium Spreads come in thirteen varieties, from classics like strawberry, and blueberry to unique and exotic flavors like morello cherry, and mango, and are sweetened with Rainforest Alliance certified organic cane sugar sourced from the Green Cane Project. These premium spreads are available in 10 oz jars, with some flavors in 16.5 oz jars, and are only 30 calories er serving. The Superfruit Spreads features a delicious blend of four unique superfruit combinations, and ten powerful antioxidants from four continents – Asia, Europe, North America, and South America. Each jar boasts 1 pound of premium organic fruit and is also sweetened with fair trade sugar and contains one-third less sugar than jam. The Asia blend features yumberries, raspberries, morello cherries, and red grapes; the Europe blend features pomegranates, black currants blended with red grapes, and morello cherries; the North America blend features wild cranberries, wild blueberries blended with red grapes, and morello cherries; and the South America blend features maqui berries, passionfruit blended with red grapes, and morello cherries. The Superfruit spreads are available in 11 oz jars and are only 30 calories per serving. Last but not least, the Just Fruit Spreads are available in eight varieties – Apricot, Black Currant, Blackberry, Raspberry, Seville Orange, Strawberry, Superfruit (red grape, morello cherry, açai berries, and pomegranate), and Wild Blueberry. They are made with 100% fruit ingredients, and sweetened by concentrated organic grape juice, sourced from an Italian winemaker. These all-fruit spreads will wow you with their delicious taste, texture, and spreadability, although as previously stated, you say be enjoying with a spoon and may not care about spreadability. Like the Premium Spreads, the Just Fruit Spreads are also available in 10 oz jars and only 30 calories per serving.